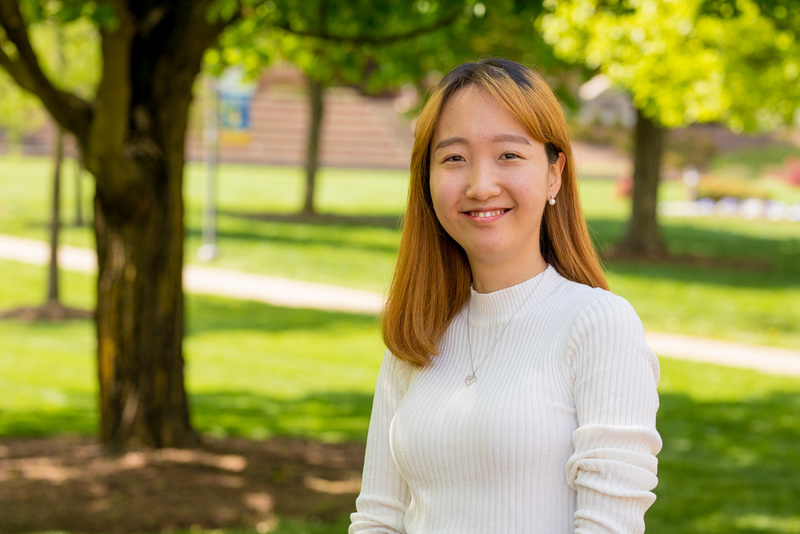 YoungJi Jang graduated from Eastern Mennonite University’s Center for Justice and Peacebuilding (CJP) not just with a master’s degree in conflict transformation, but also deep belief in restorative practices. In her practicum at the Restorative Justice Clinic (RJC) at Campbell Law School in Raleigh, North Carolina, Jang saw her theory of change – that increased understanding builds trust, which fosters relationships, which in turn enable better ways of dealing with conflict to make communities more healthy and sustainable – play out in a variety of practicum settings: the legal system, a prison and local schools. There, she participated in victim-offender dialogue in a ground-breaking felony case in the state, and facilitated both restorative circles in Butner prison and restorative dialogue in school settings. The collaborative placement at RJC grew out of years of connection between Howard Zehr of EMU’s Zehr Institute for Restorative Justice and his co-director professor Carl Stauffer and RJC director Jon Powell, who with another RJC staff member Joia Caron traveled to attend Jang’s presentation in Harrisonburg from North Carolina. 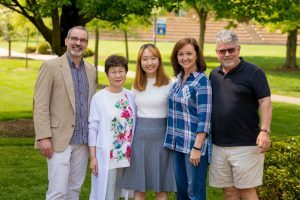 YoungJi Jang (center) poses following her practicum presentation with (left to right) CJP Professor Carl Stauffer, her mother Myounghee Lee, and Campbell University Restorative Justice Center office manager Joia Carson and director Jon Powell. “It’s very important for us to have that kind of relationship with this program,” Powell said, adding that Jang “is going to do great things” in restorative justice. Read about other research, practicum learnings by CJP’s 2018 graduates. RJC and Jang were involved in facilitated dialogue in a high-profile felony case involving a shooting that injured a child but ended in restitution for the victim and her family and community service – but also forgiveness, “tears of happiness” and hugs. In March 2017, a bullet fired by James Scott Berish struck a 10-year-old sleeping girl in a lower apartment in Durham. Berish initially fled the scene, but later turned himself in to police. The prosecuting attorney assigned to the case had attended an RJC restorative justice training, and realized this case was suited to the process, said Powell. In the federal correctional complex at Butner, Jang facilitated restorative circles of inmates and community members who met to tell each other their stories as a means of restoration. In different grade levels in schools, she helped students to resolve conflicts and to learn alternative ways of dealing with future conflicts. Jang plans to attend law school and promote the use of restorative justice in her home country of South Korea, following additional practical training in the U.S.
How encouraging to hear of the prosecuting attorney’s openness to using an RJ process in this felony case after taking an RJC training, and of Jang’s participation in this. I’m also interested in learning more about Jang’s restorative circles work with inmates and community members. I facilitate an RJ discussion group in a women’s federal prison in Canada, and am working with others to begin circles processes there. I would welcome a way to connect with Youngji to learn more about her work to support our work here. Please suggest a way we can connect.